2006 Yamaha PW 50. Picture credits - Yamaha. Submit more pictures. Take a close look at the amazing little PW50 from Yamaha and you�ll see that everything about this best-selling minibike is designed with your child in mind. The fully-automatic 50cc engine delivers smooth power, while an adjustable throttle limiter allows you to restrict performance to suit your kid�s abilities. Bicycle style brake levers are easy to use, and the enclosed shaft drive is clean, quiet and requires little maintenance. 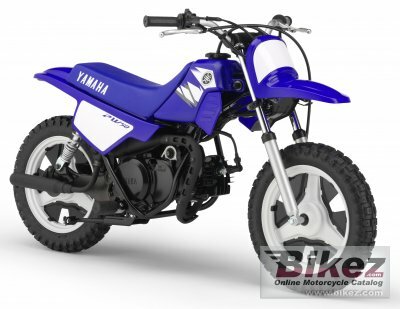 Ask questions Join the 06 Yamaha PW 50 discussion group or the general Yamaha discussion group. Bikez has discussion forums for every moped. View comments, questions and answers at the 2006 Yamaha PW 50 discussion group. You can sign up for e-mail notifications when other riders answer you. If you have extensive experience with the MC, please send us a review. If you consider buying this bike, you should view the list of related motorbikes Look at photos. Compare technical specs. And check out the rating of the moped's engine performance, reliability, repair costs, etc. You can compare the rating with other bikes.